Gentoo Forums :: View topic - [solved] Router Speedport W 724V looses IPv6 conn.
[solved] Router Speedport W 724V looses IPv6 conn.
Posted: Sat May 02, 2015 7:13 am Post subject: [solved] Router Speedport W 724V looses IPv6 conn. It's a confirmed bug since other users of the above router reported the same problem. 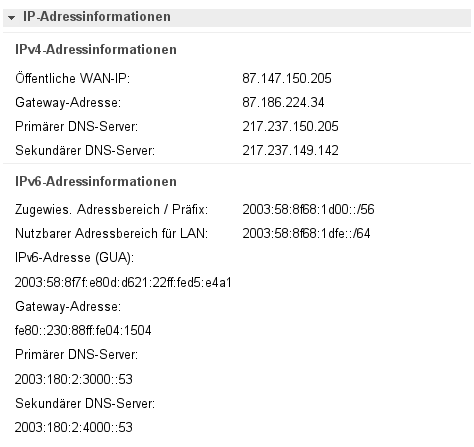 I have IPv6 connection from provider (Edit: German Telekom) and get IPv6 address via ICMPv6 autoconfiguration (SLAAC), I guess. Why did that happen? What are these ::36 addresses? I needed to reset my provider connection to get a new IPv6 prefix, then the Gentoo box got a new IPv6 management addr and a new privacy extended addr was added, and connectivity was established again. I allow all incoming, forwarding and outgoing ICMPv6 packets in ip6tables. These addresses break my IPv6 connectivity. Maybe the router is buggy? I now extended the preferred lifetime of the privacy extended addresses to be 1h higher then the connection reset interval (currently I selected 4 days) of the provider, and the valid lifetime 2h higher. Sounds like you have slaac private enabled in dhcpcd.conf (which is the default) and you don't want that? I don't know how it breaks connectivity for you unless you actively need the MAC based one. slaac stable private address is enabled in dhcpcd.conf, and I want that. Can you try upgrading to dhcpcd-6.8.2 ( or 6.8.1 if it's not in portage yet) please? 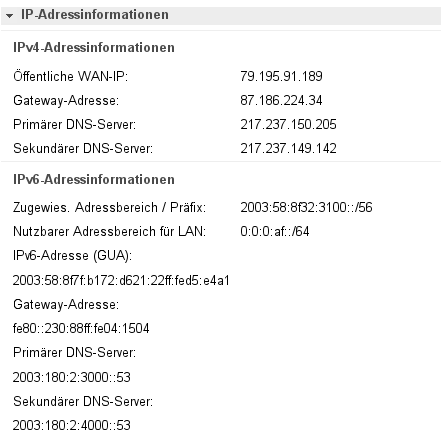 Hm, it is really the Telekom router that advertises this strange subnet, see screenshot. "Nutzbarer Adressbereich für LAN" is in English "Usable address range for LAN". IPv6 for LAN? What does that mean. Then rebooting my Gentoo box, it get no IPv6 connection / address via SLAAC. Don't know why. When then starting dhcpcd manually, I get four different IPv6 addresses in the correct 2003:... subnet. Two of kind "scope global mngtmpaddr noprefixroute dynamic" and two of kind "scope global temporary dynamic"
Why isn't the box getting SLAAC via ICMPv6 ? Can I force it somehow, without dhcpcd ? Would like to stay at IPv6 builtin privacy extended SLAAC. Anything else needed to be allowed in ip6tables beside of ICMPv6 ? When dhcpcd is started with "slaac private" or ipv6ra_own, it will disable the kernel from listening to RA's. It's also possible that something other than dhcpcd has done this - check the sysctl output to see. Man, this is a nerving story. I guess, eth1 is autoconfigured before the temp_ settings are modified via sysctl. WTF. Edit: No, also after deleting the IPv6 addresses with "ip addr del" manually, they get autoconfigured shortly afterwards with the same default temp_ values again. It's not clear, but those are maximum values, not forced values. The lifetime of the address is based on the lifetime of the prefix address offered. With Telekom propieretary router connection interval of 4d the IPv6 connection still goes down after 24h or so. It says, the RA messages are ICMPv6 type 134 and in that, the preferred and valid lifeteime of the advertised route is included. Also, it says, that on client side defined preferred and valid lifetime values for interfaces are only used for statically defined interfaces (not via SLAAC / neighborhood discovery / whatever, what is my case). So, the preferred lifetime of the RA prefix is 86400s = 24h. That does not change, either if I configure connection reset interval of the Telekom router from 24h to 4d. It is all the time 86400. I guess, that is the problem. I think, a bug report should be opened to Telekom. Just now, I changed the connection reset interval to 24h and will see, if the IPv6 connection will stay alife after next connection reset and new prefix RA. Edit: It's a confirmed bug of the router, as other users of the router reported exactly the same problem. Therefore I now disabled IPv6.